In terms of sheer environmental destruction per square meter, the mountaintop-removal method of coal mining is pretty tough to beat. A mountain with the unhappy distinction of sitting on a coal seam gets its top dynamited off and bulldozed into oblivion, while nearby valleys end up filled with the leftover rocks and dirt. These mining spoils end up burying the streams that once flowed through the valleys, harming water quality downstream. That’s why it was big news this afternoon when the EPA announced that it has put hundreds of mountaintop-removal mining permits on hold so that it can evaluate the amount of water pollution caused by these projects. What makes this even bigger news is that the EPA, in a separate action, recommended that the Army Corps of Engineers deny permits for two mountaintop-removal projects in West Virginia and Kentucky, because of the impact they would have on nearby streams. So it seems likely that at least some of the mountaintop-removal permit applications that the EPA is now subjecting to extra scrutiny will end up being denied. It’s news that comes on the heels of two big victories for coal companies. In December, the Bush EPA finalized a rule that made it significantly easier for mining companies to dump their waste into streams. 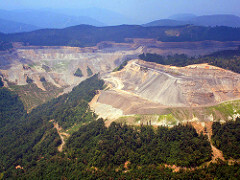 And in February, a federal appeals court reversed a lower court’s ruling that would have forced the Corps of Engineers to subject its mountaintop-removal permits to a stricter environmental review process. Now, however, it looks like the Obama administration will be holding the permits to a higher standard even in the absence of a court order to do so. You might say that in the contest between the mountain flatteners and those who would prefer to keep Appalachia hilly, the playing field just got a little bit closer to level.